HA NOI (VNS)— Viet Nam must move quickly to simplify complicated procedures and encourage farmers to learn biotechnology techniques in planting domestic crops, particularly in planting genetically modified crops, agricultural experts have said. 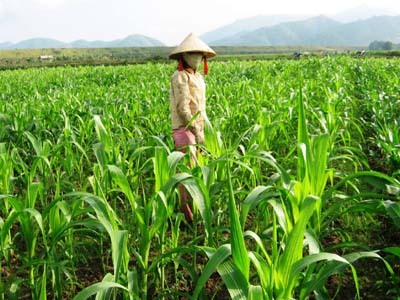 Speaking at a recent conference on global prospects in using genetically modified organisms, Nguyen Van Tuat, deputy director of Viet Nam Academy of Agricultural Sciences, said genetically modified corn has been planted on a trial basis since 2007. From this test, seven samples of corn have proven to have insect resistance, while doubling the ordinary harvest, although no pesticides were used. Currently, Viet Nam must import about 5.8 million of tonnes of animal feed each year. Last year, some US$3 billion was spent on importing feed, an increase of 22.3 per cent compared to 2012. He said the production of feed remains untapped in Viet Nam. The planning of feed zones and the diversification of planting feed crops, including the planting of genetically modified crops, would help increase local productivity and gradually reduce imports in the future. Tuat said the use of genetically modified plants for domestic crops has become an indispensable trend and has won the Government's approval. Meanwhile, the Ministry of Agriculture and Rural Development has continued to complete procedures to plant such crops in the future. Professor Nguyen Lan Dung, however, said Viet Nam was slow and too cautious to plant genetically modified crops on a widespread basis. "These kinds of agricultural products have appeared in the market for a long time. We've imported genetically modified corn, soybeans and soybean meal from the US and China. Why don't we plant these on a large scale, as they should be? ", he asked. Many countries have used genetically modified plants for years and there has yet to be any scientific reports detailing risks to humans, animal health or the environment. Moreover, such crops have demonstrated their ability to resist insects and drought during test-planting in the country. According to Dung, complicated procedures and a bias about genetically modified plants were the main reasons for the delay in using biotechnology. "Scientists must show evidence which proves these plants are harmless to human and animal health. They are just like other kinds of crops", he said. The ministries of Natural Resources and Environment, Agriculture and Rural Development and Science and Technology should work together to reduce legal procedures and cooperate with foreign scientists to quickly apply the technology. Clive James, Founder and Chair of the International Service for the Acquisition on Agriculture Application (ISAAA), said that biotech crops were demonstrating their global value as a tool for poor farmers who faced decreasing water supplies and increasing weed and pest problems. Also, the effects of climate change would only continue to expand the need for this technology. The latest report by the ISAAA detailed how more than 18 million farmers in 27 countries planted biotech crops last year, an increase of 5 million hectares of biotech crops.